Google Chrome just got an awesome feature on Windows 10 by which users can easily type an Emoji in any text field inside the browser. One major difference between the social media experience on a smartphone and a PC is Emoji. It is easy to type an Emoji in a smartphone and it actually plays a crucial role in communication, at least for the teens. However, users rarely use Emojis while browsing social media from their laptops or PCs. If you’re crazy about emojis, you’re in for some treat. Google Chrome just got an awesome feature on Windows 10 by which users can easily type an Emoji in any text field inside the browser. Even though Google is way ahead of the competition they are still adding new features to make the user experience better. One such feature that Google added recently is a dedicated Emoji option in the context menu. Adrienne Porter Felt, Engineer & Manager at Google Chrome, recently announced the feature on Twitter. Brand new feature on Chrome for Windows this week!! 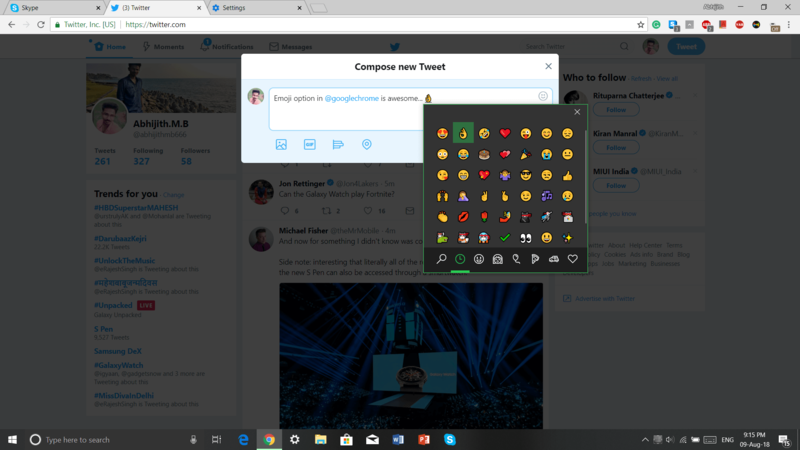 To get emoji panel, you would need to update Chrome to the latest version and upgrade your PC to latest Windows 10 version. The feature was previously tested in Canary build and it’s available on the latest stable version of Google Chrome, the version 68.0.3440.106. To update Google Chrome to the latest version, go to Settings by clicking on the three dots on the top right corner. From Settings, click on About Chrome. Once you have done that, Right Click on any text field and you would see a new Emoji option in the menu. Click on it and you would be greeted with all the Windows Emojis. If you would like to put Emojis outside Google Chrome, all you have to do is press the Windows key and Period (.) key to access the built-in Windows Emojis panel. You could have done this earlier on any browsers including Google Chrome too but honestly, only a few people knew about that feature in Windows 10.